In this Hall on 10 October 1930 48 victims of the crash of His Majesty's airship R101 on 5 October 1930 lay in state by permissionof King George V.
Plaque unveiled by Angela Smith Baroness Smith of Basildon, together with members of the Airship Heritage Trust. Wikipedia has this plaque in St Stephen's Hall and other websites repeat the error. 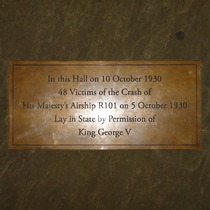 These 9 plaques are laid into the floor of the hall, in a line down the middle, in this sequence, starting at the entrance end: R101; Hastings; Wentworth; More; Churchill; King Edward VII; Gladstone; King George VI & Queen Elizabeth; and King George V & Queen Mary. Since capturing these 9 we've seen more on the stairs at the southern end of the hall. Need to visit again. Mill lived at this address, 1837 - 1851, with his mother and sister.